Warning: Readers are strongly advised to remove fluids from their mouths as well as from proximity to their computers before proceeding any further! 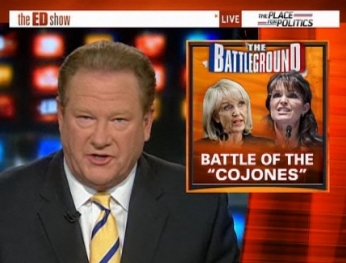 Ed Schultz on Monday accused Sarah Palin of making a sexist remark about President Obama. As NewsBusters previously reported, the former Alaska governor on Sunday said, "[Arizona governor] Jan Brewer has the cojones that our president does not have to look out for all Americans, not just Arizonans, but all Americans in this desire of ours to secure our borders and allow legal immigration to help build this country as was the purpose of immigration laws." ED SCHULTZ, HOST: Sarah Palin is hitting President Obama below the belt on immigration. The same Sarah Palin who claimed to be a victim of sexism during the 2008 campaign has no problem making sexist remarks about the President of the United States. Here she is at home on Fox News Sunday. Honestly, the lengths folks on MSNBC will go to trash this woman while defending the president they helped get elected is astounding. This has become a very common term for courage with a lack thereof indicating cowardice. In recent years, the Spanish term for balls "cojones" has been similarly used. As such, to suggest this was sexist on Palin's part indicates a lack of inteligencia and sinceridad on Schultz's.